How to test an idea and get some feedback with small resources? Good way to test the product or service hypothesis is to create simple landing page that tells the idea’s value proposition. The simple landing page is not enough, since we need to get visitors to the site. The cheapest way to get visitors is to tune the site with SEO keywords and sitemap information. Search engine bots use that information indexing the page and its relevancy. Unfortunately gaining visitors only by SEO takes time and site content must be “lively”. The fastest way to gain visitors is to use SEM, search engine marketing, and spend e.g. 7€/day in advertising. By this way two things are achieved: visitors to the site and the quality of keywords. Good keywords generate more traffic and bad keywords less. This is one way how services are launched world-wide. Ideas are tested with landing pages and search engine marketing where different search terms are tested and analyzed. Good tool for this is Google AdWords. Usually landing pages gathers potential customers’ e-mail addresses e.g. “sign-up for free beta”. This gives also insight about the demand: if there are lots of sign-ups, the idea may be good. For example Dropbox has tested the idea with simple landing page and gathering E-mails of potential users. By the SEM it is easy to direct traffic to the site and amount of visitors can be adjusted by SEM budget. More money, more visitors. Stories tell that several start-ups in US have done the initial testing by this method and they have spent under $10/day for SEM. Then they tell to the world that they have gained hundreds of beta testers to their service and are sure about its success. I wanted to learn how this kind of approach works in real life and we created landing page for our new service idea. 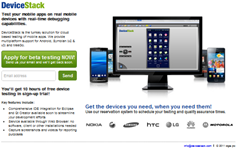 The DeviceStack is service for mobile developers who need to test how their application works in different devices. Our hypothesis is that there are huge amount of Android devices on the market and that is problem for developers. This service helps application developers in verifying their applications in different devices with different characteristics (screen sizes, performance etc.). So we need to test this hypothesis and one way to test the potential is to use landing page, SEO and SEM. We have learnt so far something about user demographics, which keywords work best, conversion to beta sign-up and copy of the site. This entry was posted in applications, innovation, Software development by Petri Poikolainen. Bookmark the permalink.